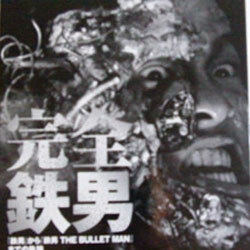 Is « Perfect Tetsuo » a complete transformation of Man its industrial form imagined by Shinya Tsukamoto? Did he succed to get to a state where the human side has been turned into a simple metallic thing? That’s what i’ll try to explore in a magistral book entitled « Tetsuo Perfect« , an object that will be like the Holy Grail for all those who have already fallen in the endless nightmares of the frightening director who doesn’t have to prove his talent anymore. Trying to understand Mr. Tsukamoto’s universe is not an easy job: it’s like racking your brain to dig out some explanation, until you find a reason to the violence that he shows us. It’s an effort that the viewer must accomplish in order to start to understand and to get in the twists and turns of his mind. However, when I find myself facing a book more than complete and astonishing of details written at 99% in japanese while my japanese understanding is limited to common words like « Yume » , « Daijobu« , « Gomen » or even an energetically « Gambatte« ; I can only imagine what the images are telling me. But thinking about it, I started thinking that the experience can be even more mysterious and thrilling, because isn’t trying to understand Shinya Tsukamoto less interesting than feeling Shinya Tsukamoto, living what he shows us or catching the meaning of his pictures? That’s how i’ve started my trip as a puzzled amateur: slowly opening the book, which comes in an enthralling black cover and taking care to not get lost in this attracting darkness. When I discovered the first pages which contain pictures that sent me back directly to the first experiences I lived with this director, a feeling of joy started to flow in my veins. 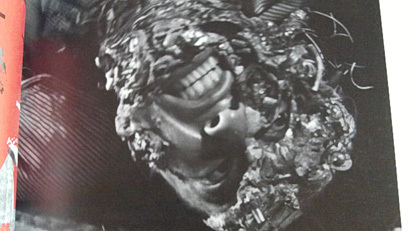 Some pictures taken from the first Tetsuo movie made me quickly fall back into Shinya Tsukamoto‘s crazy universe, coming with Kei Fujiwara as photographer: an accomplished artist and actress in the first Tetsuo movie but also responsible for films like Organ (1996) and ID (2005) – some surreal, violent and experimental works. If we had to remind some of you what Tetsuo represents, here is what I can say. It’s a 1989 film, directed, written, produced and assembled by Shinya Tsukamoto with Chu Ishikawa as the soundtrack writer. This experimental and fictional 67 mins work in its original shape, is about a man that slowly starts to turn into a metallic monster by merging with industrial stuff, from an iron stem to a small piece of metal that starts to grow out of his cheek. 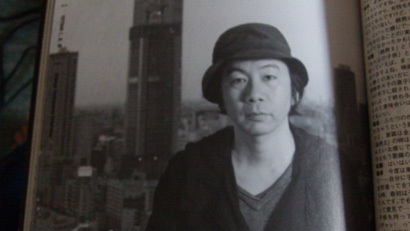 But let’s get back to the subject of this article: Perfect Tetsuo (KANZEN TETSUO), ultimate form of an unprecedented admiration for an unparalleled director. 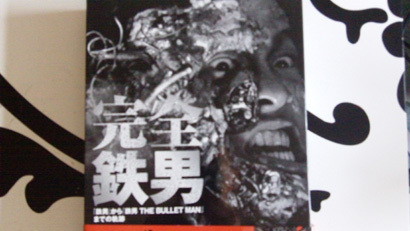 Based on the movies Tetsuo (1989), Tetsuo : Body Hammer (1992) and Tetsuo : The Bullet Man (2009), it contains a little less than 160 pages with storyboards, pictures of backstages, making-ofs and interviews with Tomorowo Taguchi, Eric Bossic and of course Shinya Tsukamoto. And there’s also the manga Tetsuo, drawn by Shinya Tsukamoto 20 earlier. Totally exclusive. These unique elements let us discover or rediscover Tsukamoto’s universe and his Tetsuo trilogy. It’s so full of details that one feels almost shameful not to be able to read japanese: a letter to Mr Renji Ishibashi, storyboards aplenty, finalized scripts, backstages of the Tetsuo movies, impressions on the first international diffusions, the Premiere Metal Night & Roadshow Eve, the first critics of the movies, interviews of Taguchi Tomorowo and Shinya Tsukamoto, explanations on the special effects and all the material used in the films, the Tetsuo manga, one part about the One Stop Animation used in Tetsuo, the nights in Tokyo with Tomorowo and Tsukamoto, a chapter about the « Before Tetsuo » and one about the « After Tetsuo » and finally Tetsuo in the US. But in addition to offering us a more than complete book, the box comes with a DVD entitled Tetsuo : The First Cut, that gives us a 77 mins version of the first Tetsuo film, which originally lasts only 67 mins. So, it’s 10 additional and unpublished minutes that we can find on this DVD. A real director’s treasure that nobody has ever seen. 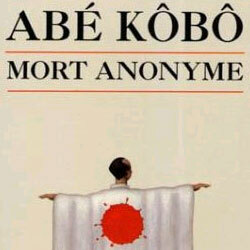 It’s the first time that such an edition is available to the public. Needless to say that Shinya Tsukamoto’s early hour fans can only rejoice to see the first version that was invented by Mr. Tsukamoto. 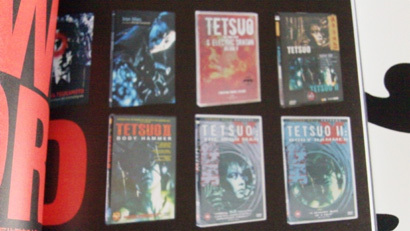 It’s important to know that the DVD doesn’t come with any subtitle, but it’s is not really important: Tetsuo is not a movie with dialogues but a film made of pictures and sounds, a work that plays with our visual and sensorial perceptions. Seeing this version that takes us into the original director’s vision is just so sensational. 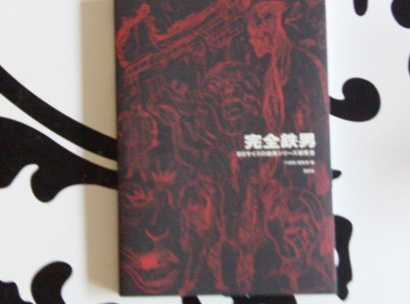 If I had to make a quick review of what we can feel by reading or should I say, by looking at the pictures of this book that moves below our eyes, it’s the impression to live again the terrifying story that we see in the Tetsuo trilogy. 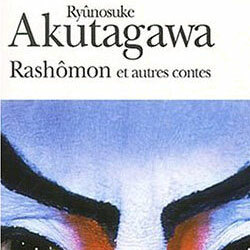 A frightning book that has taken place on my shelf, displaying the japanese cinema pride and imposing respect with its more than beautiful aspect. To put it in other words, it’s a unique collection object. For those who want to buy this box, it’ll not be easy but you can find it on Amazon.JP or Fujisan. I’d like to point out that i’m a native french speaker and it’s an english critic of a japanese book (that i’m not able to read). So, there is no need to tell you that the task was not easy and i’ve done my best to give you my impressions that i’ve expressed in my original french critic. > For those who want to buy this box, it’ll not be easy but you can find it on Amazon.JP or Fujisan. C’est vrai ça, pourquoi faire simple quand on peut faire compliqué. Effectivement d’autres liens existent pour acheter ce produit. Celui-ci peut-être considéré comme plus accessible. Merci pour l’information et les remerciements sur l’article.